Announcement of the filing of no-fault dissolution papers appeared in the Times near the obits. I read it over oatmeal with raisins. I saw another article standing in a grocery line to pay for an organic turkey. Front page in the Enquirer beside a photo of Armstrong on the moon. On the noon news a cartographer led in to a holiday weather forecast with a satellite photo of earth at midnight, pointing to black outs around war zones, fading to videos of street lamps and security flood lights with motion detectors. A state park in New Mexico claimed the title of darkest place on earth using the Bortle Scale. A couple in Miami named their first daughter Venus. An interview with an astronomy professor who developed an elaborate infidelity metaphor involving Earth and Heaven got tweeted worldwide. The night came on in silence. My family and friends flew in for Thanksgiving on Wednesday night. They told how they leaned toward jet windows to trace the light rivers of freeways and constellations of big box parking lots. As we settled as my table, I lit six beeswax candles and admired the shine of my polished silver. I’d found online a brimming dipper poem, a two-part ode to both big and little. We read it in unison. Silence was our grace. My son played a bubble-bursting game on his cell phone with his hands under the table, pretending to look prayerful. Mother asked him if he had ever seen the Milky Way. He shook his head without looking up. My second cousin-once-removed described the allure of a one-way trip to Mars and passed mashed potatoes. His wife, the only lawyer at the table, said the divorce was expected, that this happens whenever one side stops paying attention, takes the other for granted. My son achieved a high score that rang bells. George turned to his sweetheart of forty years, the woman we wondered why he had never married, Marie, remember those shooting stars? Behind the barn? Perseids. Yes. She unfolded her napkin. August in Pendleton. Your father’s dapple-gray mare in the north pasture, the one with the blaze. On our backs in grass and the universe above us. That night started it. The 2010 census found that more than 80 percent of Americans, like me, live in urban areas. Human beings have lit up the world with traffic lights and street lights that never sleep at night. Some nights, even on nights without Oregon’s fogs, it is hard to see the Big Dipper because the night sky is filled with reflections of urban light. As a plane descends into Portland I can track where I am by the brightness of the freeways, the position of the parking lots around malls. The alienation I feel at times from the night sky is similar to a divorce. Something I knew well, something I trusted — is gone. It’s possible to buy into eco-tours to travel to the darkest places on earth to experience what the night sky looked like to human beings for thousands of years. Most of us have to work to take children somewhere distant from where we live to see the Milky Way. This is the feeling that prompted me to write this poem. 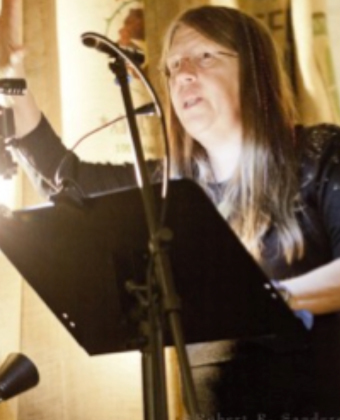 Tricia Knoll is an Oregon poet who lives in Portland where the night sky is often not as brilliant as she would like. Her work leans often toward eco-poetry — including her recent collection, Ocean’s Laughter, about a small town on Oregon’s north coast (Aldrich Press, 2016), which combines lyric poetry with eco-poetry. Her chapbook Urban Wild (Finishing Line Press, 2014) looks at how people interact with wildlife in urban habitat.